Early season variety, dark fruit with small pit. High yield, and average size fruit. Produces few suckers, excellent for transformation. Can be eaten fresh even late in season. Mid-Season to late variety, bush of medium height with good yield. 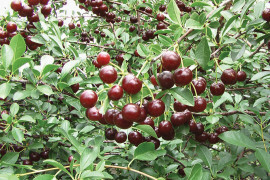 Very good size berry among the sweetest in the dwarf sour cherries with an easy pit removal. Late season variety, from dark red to black fruit. 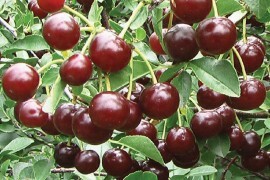 Variety with biggest fruit available, more than 6,0 gr. Excellent for fresh market, good flavor. Average to high yield, produces few suckers. Early season to mid-season variety. Exceptional high quality dark red fruit with very good flavor. Plant is fairly vigorous with few suckers. Perfect for fresh market. 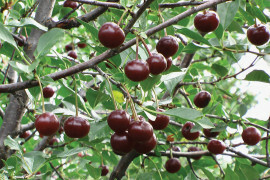 Late season variety, dark red, very good flavor and high yield; resembles the Carmine Jewel but with later crop. Excellent variety for transformation. Early to mid-season variety. The tall (2,5 m) and highly productive bush, produces suckers. Berries of good size, bright red and are mainly used in processing because of easy pit removal. Probably the most productive dwarf sour cherry.